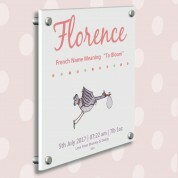 This gallery style wall art print is makes a beautiful gift to welcome a newborn girl. Our in house artist has lovingly produced an original watercolour colour illustration especially for this piece - a purple stork, carefully carrying baby to her new home! 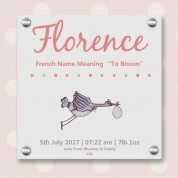 The design includes baby's first name in a large, scripted font. Below features the meaning and origin of the name. You even have the option of including the baby's birth details (date, time & weight) and a short personal message. The wall art is directly printed onto polished 5mm white Perspex, using UV printing technology. It is made complete with an added textured layer to the illustration. 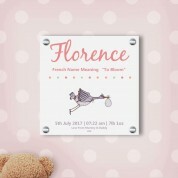 Specially designed with the precious baby in mind, she is sure to have nothing quite like it in her nursery! The generous print measures 30cm x 30cm (12” x 12”) and we supply you with quality 20mm stand off wall fixings which complete this gallery standard frame.